Our services are professional grade for serious aircraft buyers, sellers, and professionals. We ask for your credit card so you don't experience any interruption to your aircraft alerts, saved aircraft favorites and aircraft search data if you decide to continue your subscription after the trial period. You never have anything to worry about because we offer a 60 day 100% satisfaction guarantee. We have helped over 9000 of people just like you find the perfect aircraft! Take Me Back to Sign Up Now! Not at all! You are under no obligation when you sign up for a monthly subscription. You can cancel at any time by simply contacting us. If you are not completely satisfied during the first 60 days, we will refund every penny you paid. There is ZERO risk involved. We make sure our customers are always 100% satisifed. Take Me Back to Sign Up Now! Free "Comprehensive Tuturial Video" explaining our tools. 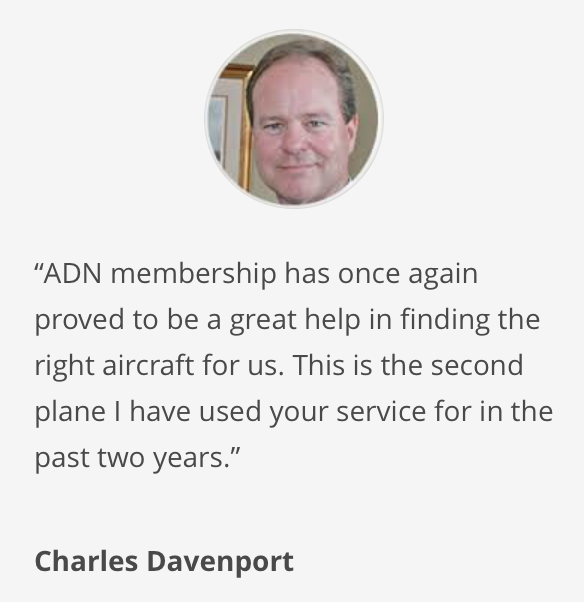 Try the ADN Aircraft Research Membership risk free with our 100% Money-Back Guarantee. If within 60 days you don't feel that our tools have brought you real value, we'll return every penny – no questions asked! Call 1-800-745-1700 anytime with questions!